In "Patterns 9622-9999" I included images of unknown patterns dated 1927-1938. The images below are of pieces lacking a date cipher or dated after 1938, to which, so far, I have been unable to allocate a pattern number. The first image is of a dinner plate with pink ground to rim below an embossment which I have not seen before. The factory mark is scratched through as a seconds. 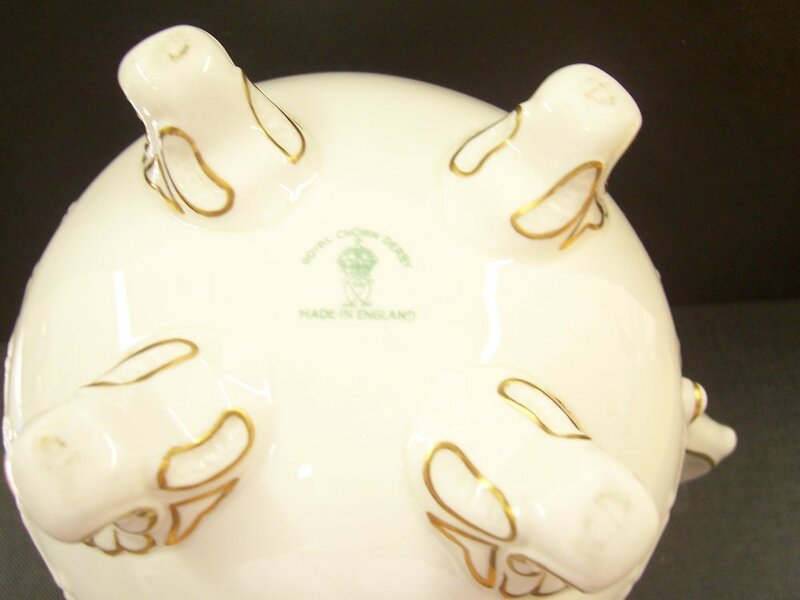 The coffee cup is listed as being in the "Kent" shape in outlines included in a trade price list dated December 1952, but this no doubt added to the confusion and by May 1955 it was shown as being in the Surrey shape. 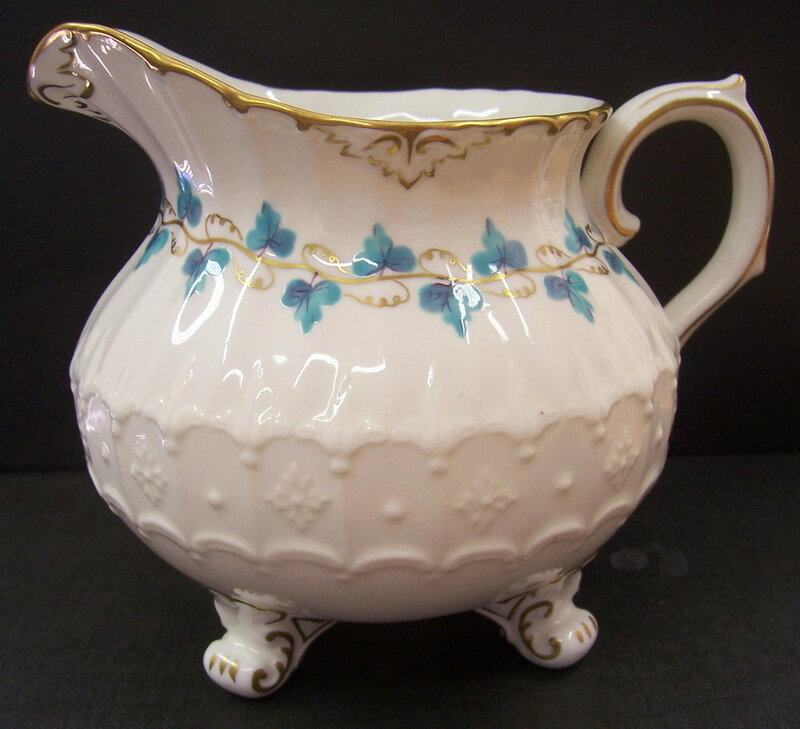 Celadon ground to outside of cup with border pattern as "Spring" but all in gold. Part tea set dated 1940 in the Beaufort shape with powdered green ground and posie flower sprays. Another part tea set with square tray also dated 1940 with the cup and saucer in the Beaufort shape. Powdered maroon ground with posie flower sprays. Edinburgh shape coffee cup and saucer together with a cup and saucer and orphan saucer both in the Chelsea shape. The use of the black ground is unusual as it was regarded as being very difficult to fire consistently, and I suspect that these examples are trial pieces. Royal shape dinner plate with gold "Wilmot" pattern over cobalt ground. Posie litho centre. Factory mark for 1968. Saucer of unknown shape with green ground and gold parabola pattern. Gold edge and line at shoulder. I include the fork alongside as it is such a good match. The green is similar to that used for ware produced for the Pakistan embassies, but further research is required. Chelsea shape coffee cup and saucer with maroon ground to below shoulder, gold edge and shoulder line. Unknown shape dinner plate with celadon ground to rim, gold edge and shoulder line. Brighton shape plate with cobalt band to rim, posie centre and gold scrolls over a blue ground. Surrey shape teacup and saucer with salmon ground. These appear in several ground colours, but only those which have the addition of Wentworth gold strawberry leaf sprays are allocated a pattern number. A part tea service in the Surrey shape with celadon ground. Gadroon shape plate with gold pendant sprays extending below shoulder, part raised in the first example. The cup and saucer are in the same pattern but with the addition of red and blue enamel. Side plate with maroon band to rim. Gold edge and centre line. Dated 1939. Version of the "Melton" (barbed wire) pattern on the "Brighton" shape with cobalt ground and central posie spray. Rugby shape plate with Dean centre - "Baslow Bridge". Sauce boat in the Burford shape. It would have been sold with a stand which is missing. Vine pattern enamelled in turquoise. Unusual plate with factory mark for 1944. It is in the Ely shape. Oriental scene with enamelling by hand in multiple colours. Apart from the exotic birds and very ornate vase with flowers, there is what would appear to be a church in the background with palm tree behind it. Pattern of gold swags and scrolls, part raised. The plate in the third image has a grey ground to the rim extending to the shoulder, with "Diana" pattern over, hand enamelled in turquoise. Patterns A1190 and A1191 are similar. Burford shape plate with grey printed country house scene. Teacup and saucer in the Elgin shape. A version of Asian Rose but with green enamel and all flower heads in red. Version of A1265 Fifth Avenue pattern but with cobalt ground. 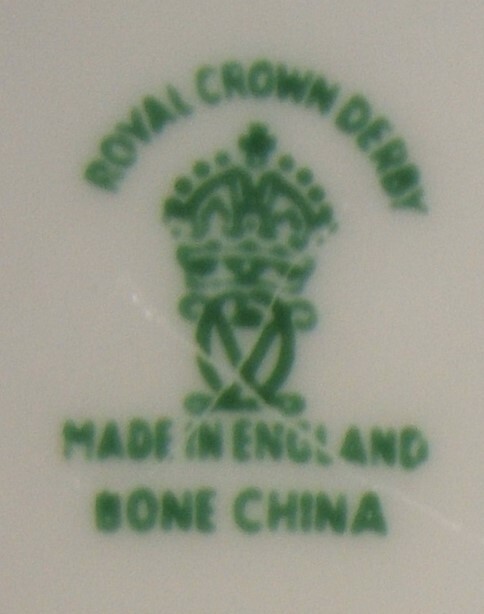 Factory mark for 1952-64 Soup and stand in ely shape with ivory ground inside bowl, thick gold edge, maroon band and unusual black line. Silver shape plate with hand painted posie sprays as "Glenmont" but without the purple beading. Plain shape plate with maroon band and Dean Lathkil Dale centre. Saucer with celadon ground, gold line and Ellis centre. Factory mark for 1944 and made for Foster's Westwood Village, Los Angeles. I am not sure of the shape, but perhaps it is "Mostyn" - See A553. Cobalt Ground to rim with gold bird pattern. "Exeter" centre. Factory Mark for 1952-64, scratched through as a second. Coffee cup and saucer with date cipher for 1946 in the gadroon shape with ivory ground and bird centre in square panel. Similar to A328 and A550. 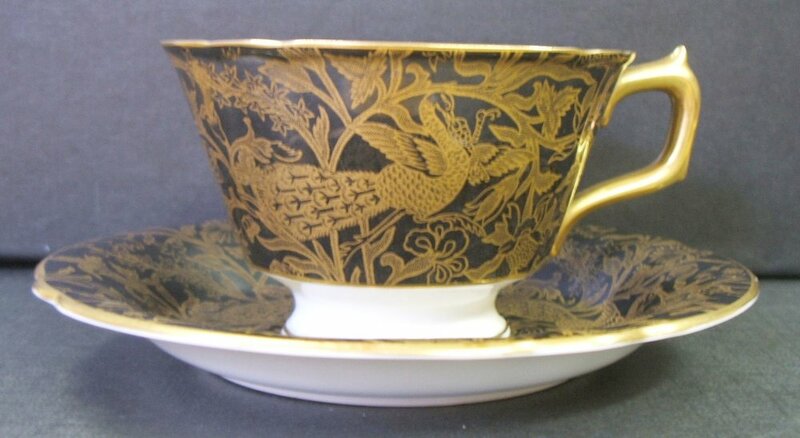 Version of Vine pattern A767 but with etched gold peacock and worm centre. Mark scratched through as a second.